An interesting day for spot price silver, which was in stark contrast to spot gold, although the technical picture for silver is perhaps a more realistic one for the two commodities at present, with gold breaking higher once again, but with a gapped up move which could prove to be a bearish signal if confirmed in due course. Silver on the other hand is looking very weak at present, with a further shooting star candle following yesterday’s silver trading session, which comes after two consecutive bearish signals and the previous shooting star, all of which suggest a very weak market. 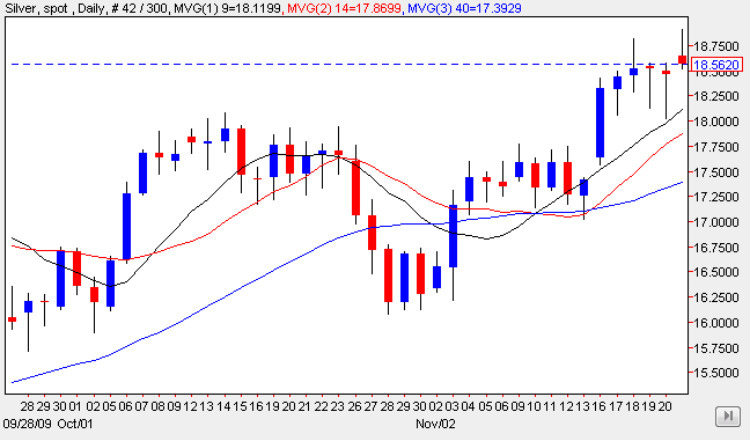 This is all in sharp contrast to the gold market which continues to surge higher, but today’s gapped up candle, whilst a positive signal, could actually prove to be the first element of a bearish pattern, which would seem to be suggested by the silver chart, which continues to prove resistant to the leverage offered by the gold market. However, despite the apparent weakness, the three moving averages are still providing solid support to the move higher and until we see these breached in any significant way we must assume the current trend remains intact although the last few days may have provided an early warning that the market is about to stall or even reverse.